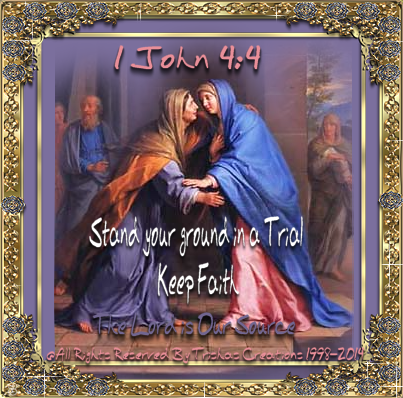 "Stand your ground in a Trial – Keep Faith"
Welcome to "Stand your ground in a Trial – Keep Faith"
In a trial the strength of your faith and your patience will eventually give you the "‘victory”. Satan - he will test your faith as soon as you act upon the promises in the word of God. He will try to get you to waver between faith and unbelief. He will try to make you feel unworthy of, or too guilty for receiving anything of God. He will try to force you to look at the circumstances around you, and situations around you, instead of looking to Jesus for your answers. However, God turns al of Satan’s strategies to your Good. First, the trying of your faith will bring forth patience, which keeps you from being moved by your natural senses. ‘Patience’, means being steadfast, unmovable, consistently the same, unwavering, unyielding to outside pressures. The Lord is Our Source; He is waiting for you to ask Him to come into your life. Jesus still prays and intercedes for all His children because He wants their faith established in God’s word where it will not waver when pressures build. Don’t put your conditions on their answers; they determined not to bow down to the Devil no matter what happens. Let your faith speak. God honored their faith. When life is easy/convenient, most people readily acknowledge that God answers prayer. But when things get difficult, then they learnt whether their faith is strong enough to take the heat of the furnace, or whether it will waver and die. Satan has taken from you long enough; he would love to have your children, you, your family, all you have. But, you need to decide that you are not going to let a prickly little thistle tell you, a mighty cedar of Lebanon, what to do. “Greater is he that is in you, then that he is in the world.” 1 John 4:4. He is a big God. God is a giving God who wants to give you the desires of our heart. He has given you all the promises in His word to stand by faith; He solemnly promises to perform each of them. The temptation is to give up and to doubt God’s word, but don’t do that because faith depends on the word of God for its strength. The more you add the word to your faith the stronger your faith becomes, and the more you learn to trust God with all of your heart. Trusting in the Lord with all your heart means that you depend on God’s love, faithfulness, unchangeableness, regardless of how things look on how you feel. Trusting with all your heart means you do not depend on what your head tells you, you do not lean to your own understanding. Even today’s God sends His angels to protect and deliver His children. And Jesus Himself will be with you in the midst of every trial, to give you joy and peace.